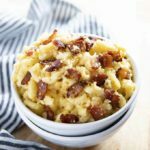 Bacon Mac and Cheese is a delicious and easy to make baked macaroni and cheese! 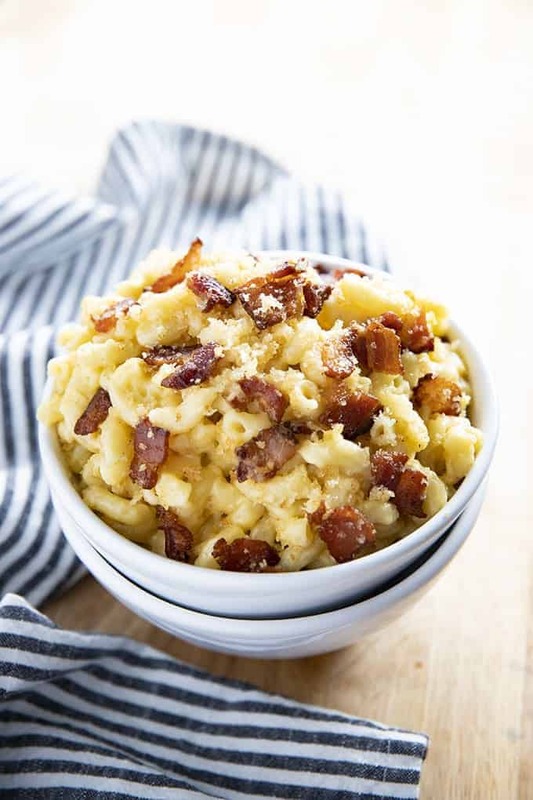 Creamy, cheesy, macaroni is topped with bacon and breadcrumbs for an unforgettable meal! This recipe was originally published on my blog on March 11, 2016 and has been updated with new photos! We absolutely LOVE mac and cheese in this house. 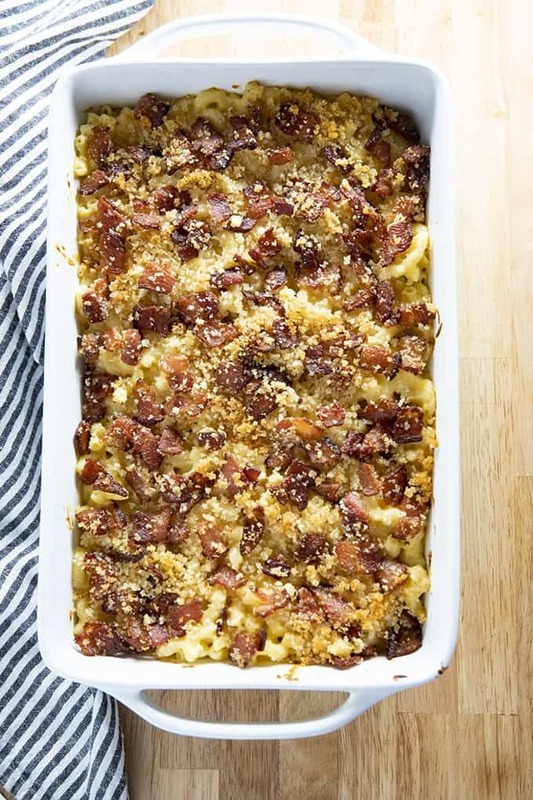 My kids are big fans of my Instant Pot Mac and Cheese, but this one here with all of the bacon and toasted breadcrumbs on it…yeah, it’s my all time fave! The first thing that I do is dice my raw bacon and cook it over medium-high heat until it’s cooked through. Once it is cooked, I dump the panko breadcrumbs in and stir them around with the bacon. Then, set the bacon breadcrumb mixture aside. While the bacon is cooking I shred up all of my cheese. For best results shred your own cheese and don’t use the bagged pre-shredded. Set the cheeses aside and start boiling your macaroni according to package directions. Melt your butter and whisk in the flour. Let the flour and butter cook for about one minute to get rid of the “floury” taste. Next, slowly whisk in the milk until you have a smooth mixture. Now you will let your milk mixture simmer over low heat for about 5 minutes until it has thickened. Then, turn the heat off and stir in all of your shredded cheese until melted. Mix your cheese sauce together with your cooked macaroni and pour into a large baking dish. Top evenly with the bacon and breadcrumb mixture, then bake for 20-30 minutes. In a large nonstick skillet, cook chopped bacon over medium heat 5-8 minutes until it starts to turn golden. Add panko breadcrumbs to the bacon and stir well. Remove from heat and set aside. When butter is melted whisk in the flour and cook for one minute. Add the salt and pepper to taste. Slowly whisk in the milk until your sauce is smooth. Bring to a simmer, then reduce heat to low and simmer for 5 minutes whisking occasionally until sauce has thickened. Add the cheeses to the sauce along with more salt and pepper to taste if desired. Stir and allow to cook for a few minutes until the cheese is fully melted. Next, add pasta to the sauce and stir until coated. Pour macaroni into a large 9x13 inch baking dish. Sprinkle bacon/panko mixture over macaroni. Cook at 350 for 20-30 minutes until golden brown and bubbly. NOTE: This recipe is best when you shred your own cheese. I do not recommend using bagged pre-shredded. If I make this the night before, would it be better to cook and reheat or assemble and then cook the next day? Hi! I would probably go ahead and cook, then warm in the oven. This recipe is really great, but I had some confusion as to the “simmering” directions. Below the ingredients it says to bring it so a simmer and then to lower the heat, but above the ingredients it does not mention bringing it to a simmer at the higher heat. Can this be made ahead of time? I’m hoping to prepare it a day before baking. No doubt this will quickly become a family favorite!! I love, love, love this macaroni & cheese version! 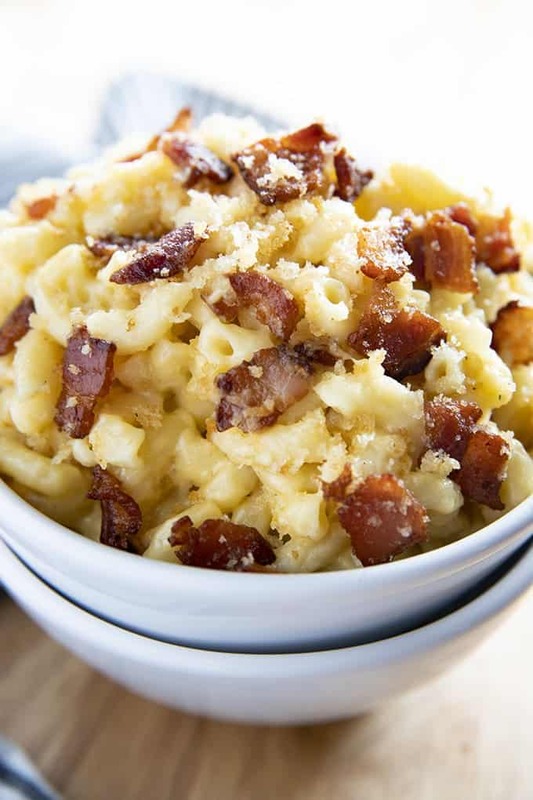 Bacon makes everything more delicious, which hardly seems possible with mac & cheese! And the breadcrumbs?! Yum. Amazing recipe! Bacon makes everything better IMO and takes this one over the top! Okay, this is beyond delicious with all that bacon! For sure it’s going to be a family favorite! Seriously does it get any better than this!??! A new favorite in my house! Anything with bacon is always a hit! Looks like a new favorite in my house! What a great side dish to enjoy any day of the week. I know what I will be making this weekend! Bacon is such a flavor enhancer. I can just imagine how delish this tastes. Bacon makes everything taste better!! Definitely a must try! I’ve had this and it’s amazing and the best part is, if you don’t eat all of it, it’s still good the next day! !